Even more stations are in the works! A self-service bike repair station is located outside of Francis Gregory Library. Eight new stations have been set up around the District. You can now ride your bike trouble-free in D.C. Eight bike repair stations have been assembled around the city, D.C.'s Department of General Services (DGS) announced Wednesday. The stations, which are free to riders, are equipped with an air pump and eight retractable tools, allowing for quick bike fixes for cyclists in locations that may not be close to many bike shops or may be in neighborhoods that have less of a bike support infrastructure. DGS plans to install more stations in the future. "If people feel like their environment supports their desire to bike, they are more likely to do so; and that's a win for our residents and for the District," DGS Director Christopher Weaver said in a statement. 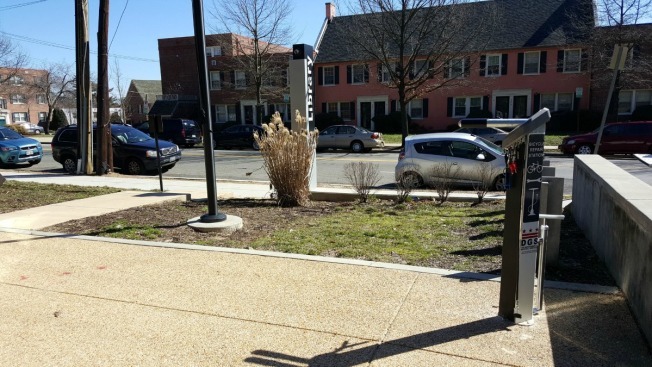 More sites are under evaluation and are pending approval for station installation this summer, including the Anacostia Library, the Barry Farms Recreation Center and the Southeast Tennis and Learning Center, according to a DGS spokesman. An additional three to five sites also are planned.